How Can You Cook Frozen Foods in an Air Fryer? If you have ever dealt with a traditional oil fryer before, you know how messy they can be. Having a hot vat of oil to deep fry your food in can create all kinds of splatters in your kitchen. It can also be hazardous dealing with hot oil. It isn’t uncommon for people who own oil fryers to get tiny burns when oil speckles or splatters out of the container. Although a modern deep fryer is designed to avoid splatters, you need to fry properly to prevent your foods from soaking a lot of oil. Unless you use a good deep fryer that comes with a thermostat to help you get the right temperature, you may end up getting greasy foods. The excessive oil can be harmful. On the other hand, air fryers give that same fried crispness to your food, without drowning your food in fatty oil. What’s also nice about air fryers is that you don’t have to worry about the mess, and cleanup is super easy. Most all removable parts of an air fryer are machine washable, and no oil is required. There are also several best air fryers on the market for you to choose based on your cooking style and needs. You can choose one with digital control such as Philips Digital Airfryer or analog control such as Philips Airfryer HD9220. GoWise USA GW22621 4th Generation Air Fryer even comes with 7 preset programs including chicken, chips, steak, shrimp, fish, meat, and cake. You can absolutely cook frozen foods in your air fryer. Some air fryers such as FrenchMay Air Fryer also come with a cookbook that tells you the temperature and time settings for frozen food. They are great for making frozen snacks and meals that range from frozen bags of mixed veggies to frozen filets of tilapia or frozen salmon steaks. When you want to cook frozen food you buy from a grocery store, you need to do some adjustments from an instruction on its bag because instructions of most packaged foods are for those who use a standard oven. An air fryer is more intense than a regular oven due to its size so when you cook in it, you need to lower both temperature and time. The general rule is to reduce temperature by 25ºF– 50ºF and cut the time by roughly 20%. For example, if the instruction suggests cooking in the oven at 450ºF for 20 minutes, air fry the fries at 400ºF and start checking them at 16 minutes. Anyway, it is recommended that you shake a basket once or twice during the cooking process to make the food cooked evenly. You can use this time to check and estimate the expected time for perfect results. (If you use T-Fal ActiFry which comes with a stirring paddle, you do not have to check the basket. Therefore, you need to check from time to time if the frozen food is cooked perfectly. Another way that we recommend cooking frozen foods in your fryer is using your microwave to thaw it out first before you fry it. That will help shorten the necessary cooking time that your previously frozen food needs to be in the fryer. It will also help remove some of the moisture from your frozen food so that it can get nice and crisp in the fryer. 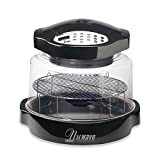 If you are going to be throwing some frozen meat, veggies, french fries, fish sticks, or tater tots straight into the air fryer, just keep in mind that they are going to need a longer time frying, if you did not thaw them first. Make sure there is enough room. Spread out your frozen food and don’t overload the basket. If it is frozen meat, do not stack them on top of each other. If your air fryer comes with a rack, then use it. So what all can you cook in an air fryer? The answer may surprise you, because you can cook just about anything that you want. Just about anything that you can cook in a traditional oil fryer, you can cook in an air fryer. Here is just a quick overview of some of the foods that you can cook with your air fryer.